I've always been a bit ambivalent about cycling as a sport rather than a hobby or pastime. It seems that, as a nation, we concentrate too much on the former and don't really translate that into what is, for most participants, a fun activity. However, a few years ago I was persuaded to take part in a triathlon where I would just be doing the cycling stint. It was the first time I'd donned a number for biking and it was actually a bit of a buzz competing against other riders. When I started to take the road biking a bit more seriously, I reckoned that the incentive of some sort of competitive event would help me get out more on those colder, darker, wetter days and it seemed to work. By entering a few more Sportives, I found I was pitting myself against mostly like-minded folk - they weren't in it for the "racing", had no intention of joining up to some road club with its regimen of training and diet, but it was a bit more committing than a ride to a cafe. One down-side of this was that I found it was starting to interfere with my "other" riding. If I had an event a few weeks away, I'd be thinking about that, wondering if I was going to hurt myself off on some mountain somewhere and I found myself turning down other riding opportunities accordingly. So, I decided to give it a rest for a while. 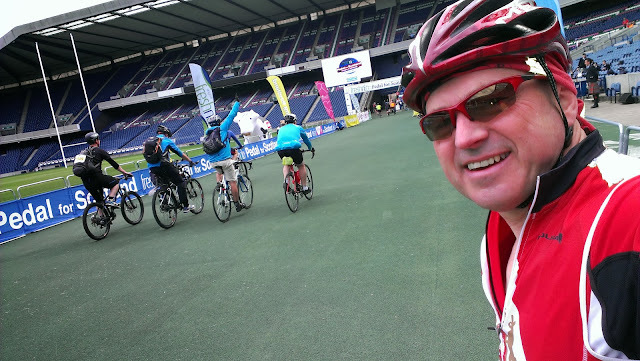 However, around September last year (2012) I got a bit caught up in the excitement of the Pedal for Scotland rides and found myself entering for 2013. When summer 2013 came along I'd not really been out on any fast road rides and with a lot of upheaval at home, I'd more or less written it off. However, as the date finally approached, I found myself getting a bit keener and so it was that I got up at 4am for a drive to Murrayfield and a bus to Glasgow for a (supposed) 6:45 start. As it happened, we were late getting through and barely made the cut-off for the start. Setting off, I felt distinctly under-dressed so I decided to pedal a bit harder and generate more heat. That worked fairly well and I found I was soon getting into a bit of a rhythm and slowly catching some of the riders who had started earlier. I did have one brief stop, to help a chap with a "puncture". It turned out that a valve core was loose so I helped him set that straight and set off again before I could cool down too much. The first feed station was in Galston but I saw no need to stop and whizzed past. I'm glad really as this was immediately followed by a bit of a hill and I'd not have enjoyed it with cold legs. The course undulated much as I'd expected and before long I found myself on a little bit I actually recognised passing Glengavel reservoir. However, the headwind along here was a bit brutal and I found myself all alone with no one to share the work with. After the descent into Muirkirk I seemed to get a little kick of energy again and overtook lots of other riders. I had one chap tucked in behind me for most of this section and while I'd have liked him to take a wee turn ahead of me, it was at least nice of him to thank me before we headed south again toward Crawfordjohn. This was actually a bit of a surprise as I was expecting to go straight on to Douglas (as per the PfS route map). It was about here that I found myself tiring quite a lot. With 55 miles down it was only half way and I wasn't sure I had another 55 mies in me. It was therefore with some relief that I made it to the second feed station. Again, I didn't want to cool down too much so I ate quickly, had a pee and set off up the road. Now, my GPS was counting down I seemed to get a whole new perspective on the ride. I knew that Carnwath would soon be putting in an appearance and that's almost home! First though were the little twiddly bits round Roberton and up to Carmichael. This latter almost had me off the bike but I persevered, zig-zagging my way up the slope to help ease the gradient. When Carnwath eventually appeared, I was again in no mood to stop. With the field having thinned out now, it was mostly like a normal ride for me and I and just set out for Balerno as fast as my legs would carry me. I turned off for the timing mat, had a brief breather and then just pootled sedately down to Murrayfield for the "proper" finish line. Overall, I really quite enjoyed that. I think I was a bit quicker than I'd expected to be as once I saw other riders ahead of me it gave me a bit of a push to catch them up. I reckon a couple of Sportives might now be on the cards for 2014 - one early season, one late.